For Immediate Release – September 1, 2018 – Oklahoma City, Oklahoma – 2018 has featured several historic milestones for many horses, riders, and owners within the National Reining Horse Association (NRHA). Adding his name to the record books this year is Spooks Gotta Gun. After crossing his million dollar mark in 2015, the stallion has earned another million – making him an NRHA Two Million Dollar Sire. Spooks Gotta Gun is by NRHA Million Dollar Sire Grays Starlight and out of Katie Gun. Bred by Eric Storey, the bay was purchased by Silver Spurs Equine in 2010. 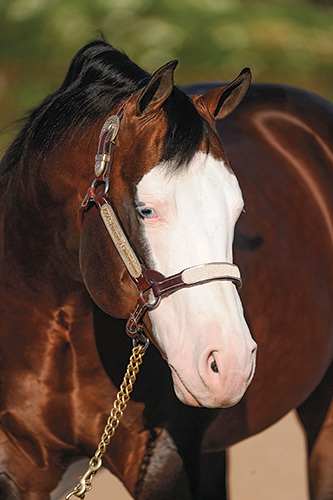 The 16-year-old stallion currently stands at Silver Spurs ranch in Scottsdale, Arizona. With 10 offspring earning more than $50,000 in NRHA LTE, Spooks Gotta Gun has sired an abundance of successful reining horses during his career as a stud. His offspring include the 2010 NRHA L4 Futurity Champion, 2011 National Reining Breeders Classic (NRBC) L4 Open Derby Champion, 2012 NRHA L4 Open Derby Champion, 2014 FEI World Equestrian Games Individual and Team Gold Medalist, 2018 NRBC L3 Open Derby Champion, and multiple finalists in many of reining’s top events.